Lamborghini has celebrated the issuing by the Italian Post Office (Poste Italiane) of a postage stamp dedicated to the Lamborghini Miura. The €0,85 stamp features a reproduction of the distinctive Sant’ Agata Bolognese mark: the raging bull on a black background. A special announcement ceremony was hosted by Lamborghini’s President and Chief Executive Stephan Winkelmann at Lamborghini’s factory in the presence of the Director of the Poste Italiane and other local dignitaries and the public. The stamp, as well as a limited number of ‘first day covers’ can be purchased from Italian post offices. The first day cover includes a booklet introducing the stamp and the legendary Lamborghini story, signed by Stephan Winkelmann. 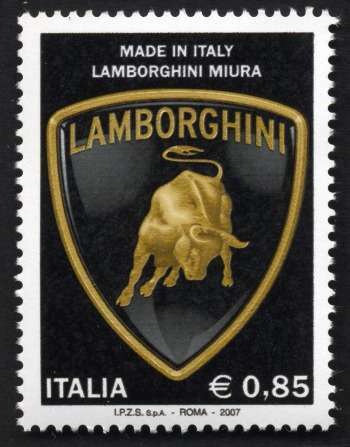 The Lamborghini stamp belongs to the ‘Made In Italy’ series with an anticipated production of around 3,500,000 stamps.